So you’re playing Team Fortress 2 and the enemy team is full of potatoes. What class should you pick so as to maximize the amount of fun you can get out of the game before the objectives are finished and the inevitable votescramble passes? Well, you could always go Battle Medic. Whilst a Battle Medic may be somewhat of a liability against a team full of combat classes, he is more than capable of handling himself against a less strong team, and has several unique features that make him a superior choice in the field of sub-par class choice combat. First, the Medic has inherently the second fastest class speed in the game. This means that against most classes you have a high chance of being able to disengage should the enemy prove proficient. You can also use this speed, much like the Scout, to flank enemy players whilst they are engaged by a more “dangerous” friendly team member. Should you pack the Overdose or Quickfix a Scout, you can attain even higher speeds if you wish to compound this advantage. Second, the Medic has his health regeneration. This is more important in Arena than other game-modes, as you can rely heavily on both your speed to play keep-away from your enemies, whilst healing yourself and peppering them with munitions. As long as you don’t get jumped or surrounded, you can continue doing this until they either cap the point or fall over dead. In normal combat, such strategies are still somewhat effective, but, with the presence of myriad health kits and supply lockers, the enemy is likely to retreat long before your health regen becomes a significant factor, and it is often easier to nab health kits yourself by just legging it. So you have these advantages, but how do you use them to kill people? You have two options of course, your melee and primary weapons, but here we are presented with a large range of viable (as much as Battle Medic is) options. But overall the strategy remains much the same, primary weapon at long to medium range, and if you can close to melee range by flanking, jumping around corners or otherwise catching your opponent off-guard, then melee him to death. With your primary weapons, you have needle based weapons and then the crossbow. Needle based weapons are very good for controlling other players. Say you have a Pyro charging at you, or a Scout running down a corridor to fill you full of buckshot. Here a continuous stream of needles filling the space they want to move into will either discourage them from continuing their pursuit or guarantee a large amount of damage as they turn into a virtual pincushion of needles. The arc also allows you to take on various enemies and obstacles without exposing yourself to fire. This is great for destroying Sentries or firing blindly over a ridge at encroaching enemies. The actual needles that you use depends a lot on personal preference and playstyle. The vanilla Syringegun affords you high regeneration and no damage penalties, which allows you to engage in short bursts and then heal up quickly afterwards. The Blutsauger allows you to leech health from enemies at the cost of personal regeneration, which makes you somewhat better an engaging multiple people at once, as you have more health during the fight, but if you’re effective at landing needles, then in solo fights you’ll often be looking for health as your needles kill the enemy before you can heal back any burst damage done during the tail end of the fight. The Overdose provides a substantial speed boost based on your Ubercharge at the cost of combat damage, but only while it is equipped. You can use the extra speed to either out-juke your opponent’s munitions and thus make up for your low damage that way, or to close into melee range and use your other weapon instead. This gun does require Ubercharge to get its bonuses, so unless you’re using the Ubersaw or actually healing other people sometimes, then you’ll probably want to switch this out. This leaves the Crossbow. When this was in a set, the higher regeneration may have made this attractive to the Battle Medic, but as it stands now you’d probably only consider it if you wished to do some sniping. 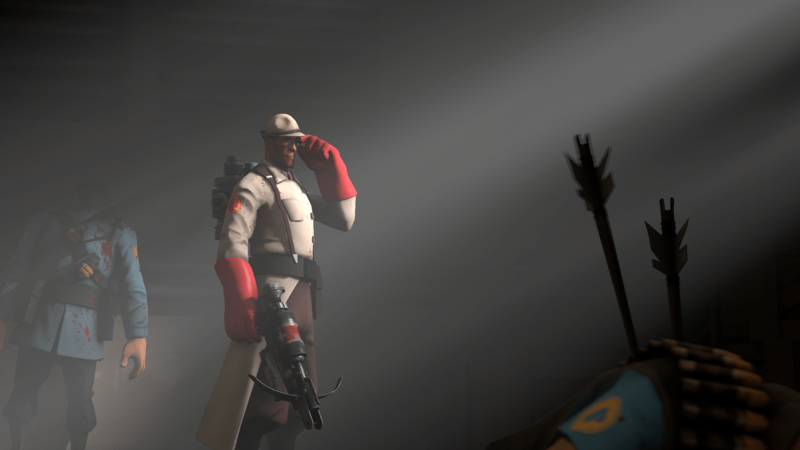 As Medic. The ramp-up does provide some decent damage at long range, if you can nail the travel time and arc consistently, but the long reload and only one held ammo makes it far less effective at deterring pursuers or anyone who gets the drop on you. This weapon is probably more suited to a healing Medic who just can’t be everywhere at once. 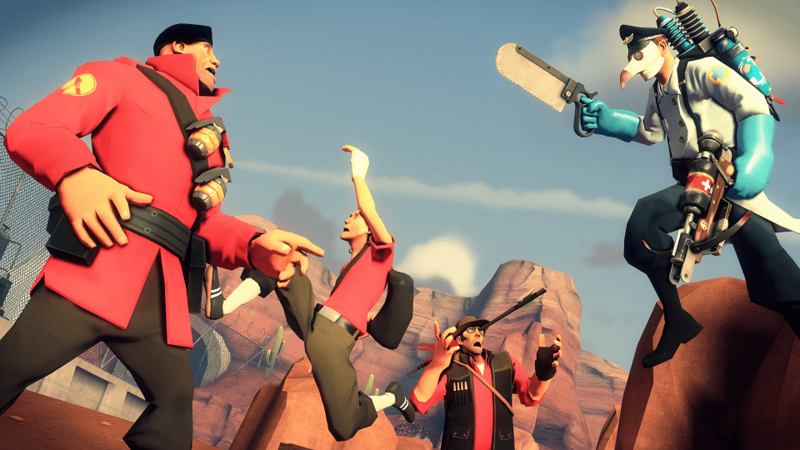 As with the primary weapons, Medic also has a couple of choices with melee. The two standout ones are the Ubersaw and the Solemn Vow. With the Ubersaw, you can build Uber, enough said. You won’t be using this on anyone but yourself, but still it allow you to use the Overdose and allows you to pop Uber to escape a dangerous situation, or destroy Sentries or other players, so it is a very solid choice. The Solemn Vow allows you to pick on low health enemies. With your speed, you can use this information to pick your fights very effectively. And it also helps knowing whether you’ll be taking a rocket to the face or two when trying to melee some pesky Soldier. Bonesaw gets a brief mention here, in that, in straight melee fighting, it’s likely to outperform the Ubersaw. But the Solemn Vow is still a straight upgrade to this. The Amputator is likewise effective, but area of effect healing taunts are something that Battle Medics are generally bound to stay away from. Which leaves us with the choice of utility pack, in the form of which healing gun you bring to a melee fight. There are three options here, the Medigun, the Kritzkrieg or the Quick-Fix. The Vaccinator, whilst useful in general Medic situations, has no useful purpose in Battle Medic play as it always requires a team-mate under the leash to be effective. The Medigun is the most useful pack, as being able to Uber oneself out of harm’s way is ideal. The invulnerability granted also allows you to fake out enemy players by making them focus attention on those people who can still be killed, whilst you switch back to melee and finish them off, and also allows you to charge enemy Sentries unhindered, which you then jump on and melee to death whilst it tries to focus on your circle-strafing behind,, or which you just run past should you see the need and the Engineer is not dead/unattentive. These strategies all require 100% Uber though, so if you want to see any use out of it, consider packing the Ubersaw and figuring out how to flank people consistently to build this charge. The Quickfix, on the other hand, is useful most any time. Just grab a Scout and start powering towards enemies with reckless abandon. Due to its smaller overheal buffer, you can then switch away from your medigun once in range knowing that your team-mate hasn’t had too much of an advantage conferred on him. The Quickfix’s charge is likewise very good at getting you out of trouble, as your amped up health regeneration does not require a healing target, and is almost as indomitable as a plain Uber is. The Uber is also faster to charge, so riding into battle on that Scout probably built a good 25% of the charge already before you even hit anyone with the Ubersaw. The one downside though is that the charge will not carry over between melee breaks. So you cannot switch from your charge to melee and back again and hope that the regeneration is still in effect. This means it is largely used as an escape mechanism more than to chain melee hits together and otherwise pester the enemy. If you’re not going to get any charge at all though, then the Kritzkrieg is your go to weapon. The healing taunt can then be used to boost your regeneration between fights, but the charge is not going to do anything for you should you accidentally heal too many team-mates. Now that we’ve fully covered weapon choice, how does this stack up in game? As a Medic, you’re primarily concerned with people who can close distance or who otherwise have an effective means of controlling the space between you and them. So this means you need to watch out for Heavies and Snipers on the most part, and anyone else who manages to flank you otherwise. Heavies have a reliable stream weapon that can prevent you from closing to an effective distance to needle them, and Snipers can just bodyshot or headshot you before you even become a challenge. The most prolific flankers will be Scouts and Pyros, whilst Demos and Soldiers may try to bomb (explosive jump at) you. The key with Scouts and Pyros is to see them coming first, and then use your needles and confined spaces to prevent them from outmaneuvering you whilst forcing them to take needles whilst you retreat. Demos and Soldiers are far harder to keep away should they get the drop on you, so it is best here to be wary of open spaces or overhangs from where they might jump from, and then retreat should they decide to bring the fight to you. Then you should aim to keep dodging the explosives thrown at you whilst in mid-range, landing as many needles as you can whilst backpedaling to avoid presenting an easy target. A good Demo at midrange will still be able to airburst stickies (or Loose Cannon nades) at you for good damage, so it may be best to just try to stay your ground and melee him. But if he bombed you it’s likely he’s got a Caber as well, so watch out for it and try to make him gib himself by keeping out of reach. The other classes, Spy and Engineer are probably the only two you have an advantage over should you manage to catch them out of position. The Spy may get off an Ambassador headshot, or be packing the Enforcer, so always try to close to melee where the guns aren’t nearly as effective, but mind for flailing facestab attempts. The Engineer on the other hand, will only have a Shotgun of some description and less speed than you do, so keep to midrange and needle him to death (once you’ve destroyed his Sentry by either edging him with your stream weapon or an Ubered melee attack). Ideally though, you’ll be looking to get into positions with your speed and picking off enemies that are weak or distracted. So you’re more likely to face Scouts and Pyros head-on more than the other classes, as you all take the back routes and against whom you have more chance against than straight combat classes, and then you’ll be flanking weakened front-line classes and providing assistance in finishing these damaged classes off, using melee where you can to do burst damage to finish off pursuers (by jumping around corners) or other enemies quickly. You’ll still get more done as a Medic who actually heals people. But if you find that doing so would just result in a steamroll, then Battle Medic is as good as most melee orientated choices (save Demoknight and Spy), and can be far more satisfying than making those HP bars go up.